With a couple of our northern Italian tours either starting or finishing in Venice each year, we often have guests ask our views on the fabled city – either because they have never been and would like some tips or because they have been and feel that ‘they’ve done Venice’ in most often a 2 night stay at best. For us, Venice is a destination so unique and amazing, that it’s hard to imagine people feel they’ve ‘done Venice’ when they’ve spent a couple of days and nights there, and have mostly only seen the main tourist spots. 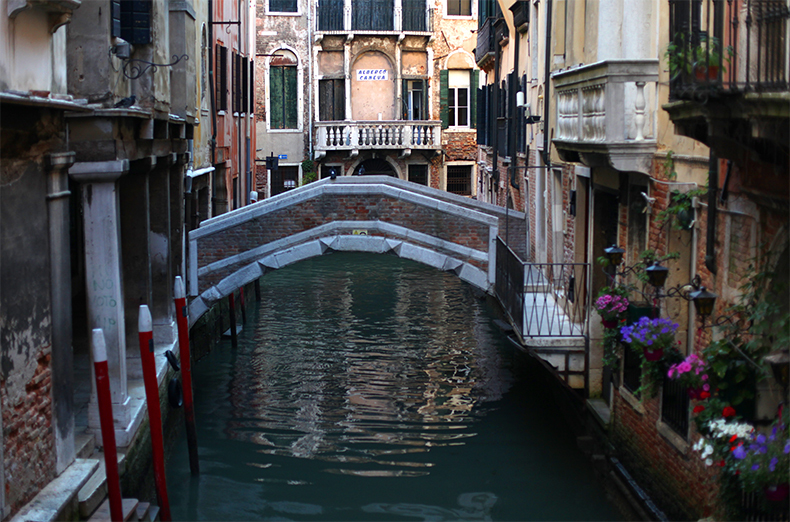 We believe an extended stay in Venice is a must if you want to discover its hidden treasures, learn the ropes of how to traverse and interact with the fabled water city, navigate its alleyways and know which piazza’s to be in, including when to avoid St Marks. So we’ve put together this short guide on some of our favourite ways to enjoy a little ‘hidden’ Venice in a 5 day stay because we believe that unless you give yourself the time to enjoy it ‘slowly’ and away from the crowds, you’ll never truly experience the magic of Venice. We always stay in the ancient, magical sestriere or neighbourhoods of Venice known as San Polo and Santa Croce. With their narrow winding pathways and canals, this is a magical area to enjoy getting lost as you explore artisan shops and bustling markets, and soak up the atmosphere of the sunny piazza’s. It’s also the perfect base to come home to after a day out, with authentic restaurants and bars, and a still bustling Venetian vibe. Santa Croce remains one of the few neighbourhoods still lived in by Venetian families, and so it has some of the best family run restaurants, and as you take long passeggiata’s or walks in the evening or early morning, you’ll definitely feel that you’re amongst locals. The boutique and very private Residenza Corte Molin. Situated in a 16th century Palazzo, this quiet B&B is centrally located in San Polo but feels like you’re away from it all, and the wonderful, friendly staff make your stay easy and enjoyable – for Ambra and her brother Marco, owners and managers, nothing is ever too much…including helping you get yourselves, your luggage and your bikes to their front door from the nearby water taxi stop…which is often a challenge in Venice. Or if you prefer a stylish room in a 15th Century Venetian palazzo with an inspirational view across the Grand Canal, try the magnificent Cima Rosa boutique B&B in the neighbouring sestriere of Santa Croce. Elegant, romantic and hugely welcoming, this B&B is like an oasis in a central, yet off the beaten track neighbourhood, and is one of those places you just won’t want to leave. We are huge fans of the fritto misto d’mare in Venice. It’s a dish of locally sourced seafood from the lagoon, often with wafer thin zucchini slices that have been dusted in semolina and lightly fried. Damian has been known to have a daily intake of this sensational dish, with it many slight variations, always under the guise of ‘research’ of course. The casual Al Ponte Storto Osteria con Cucina: Here you can sit outside, sip your prosecco and watch back-street Venetian life pass you by as the local foot traffic crosses the small crocked bridge, a linchpin between districts. Their fritto misto is amazing and the very hospitable crew at Al Ponte Storto also make some very delicious seafood pasta dishes, especially the spaghetti con Seppia ink. A nearly ‘locals only’ experience is the very lively Trattoria Antiche Carampane, which takes a little weaving and winding the narrow streets to locate. This is a refined dining experience without the “fluff”, just great food and wine, presented with care and passion by the family who own and run it. The mixed seafood antipasto is a taste sensation. Everywhere you turn in Venice, there is something interesting to see and watch, which provides for amazing aperitivo experiences, whether it’s at the water’s edge of the grand canal or tucked off to the side of a narrow alley. It is a must to enjoy a Spritz in Venice. As the home town of the famous ‘Aperol Spritz’ and the accompanying cicheti, small typical Venetian dishes including baccala mantecato, sardines in saor, bigoli in salsa (to name a few), sitting and watching Venetian life pass you by over aperitivo, is a daily pass time we love in Venice. One of our favourite early morning activities is to walk around The Rialto Fish Market. Ancient and fascinating, yet still such a part of everyday Venetian life, we love seeing all the seafood so delicately laid out and perfectly presented, and we love the vibe of the vendors as they talk amongst themselves about the daily catch. The market is a visual feast and journey through local Venetian life and culinary traditions. Well worth a look is the pre-19th-century art at the Gallerie dell’Accademia, a beautiful piece of architecture in its own right and home to some stunning collections. In addition to the beautiful permanent collection there are one or two more modern shows in the adjoining building, which are always great to see. Depending on where you start, your adventure to reach the Gallerie will take you through narrow streets and will see you cross a dozen bridges on your foray into the Dorsoduro sestriere; an area that is distinctly less touristy and is perfect for wandering, sitting in sunny piazza’s and poking through art museums. Being up and out early for morning walks, where you have St Marks square all to yourself and then the chance to enjoy the serene walk along the edge of the Grand canal or harbor towards the Giardini della Biennale, is the perfect way to start the day. We often have pitstops along the way, enjoying coffees and cornetti, and watch harbor life unfold before the hordes arrive. Enjoying the boats and waterways of Venice. There is a something just magical about the waterways of Venice, and the steady stream of gondoliers, ferries and water taxis with their beautiful wooden boats passing by. (side note for those interested – the asking price for a Venetian taxi license including the boat is only €600k). Taking time out to watch the water life of Venice and also partake in trips on its varied vessels to reach different sestriere is a unique experience and one we love. Finally, having to walk everywhere in Venice is great as it works up the appetite, which for us means being able to have a bigger and possibly ‘slower’ lunch, and also a beautiful dinner as well. As long as you stay away from the sestriere di San Marco, the throbbing heart of Venice, between 9am and 4pm and venture to other areas instead, we’re sure you’ll enjoy getting thoroughly lost, wandering, exploring and soaking up the atmospheric maze of cobblestoned paths, winding waterways and unique style of Venice. If you’re joining us on our Giro d’Italia Tour or our Dolomites & Prosecco Rd Tour, be sure to consider a few extra days in Venice to experience its true magic.